"A tasty alternative to the real thing. 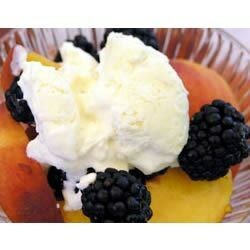 Heavy cream is lightly sweetened, whipped until stiff, and mixed with a little sour cream for flavor. Serve with scones or fruit." Using a whisk attachment on the mixer, whip heavy cream until stiff peaks form. Remove from mixer, and hand whisk in the sour cream and confectioners' sugar until just combined. Store in refrigerator. While this may not be the true clotted cream, it is a great substitue!!! It goes well with the scones. I did not find the recipe too sweet either. Thanks for a great recipe!! Tasted so similar to what I get in England. Pleasantly surprising! So big deal, not authentic clotted cream but still tasty and great to have on hand. I added a wee bit of green food coloring today and will serve it atop my St. Patricks Day cherry mousse.